Scotch Whisky - A Wee Dram Anyone? Where you find Scotch Whisky - that's when you'll find comfort, companionship, celebration..and the Scots offering you a "wee dram" of whisky (without an "e", but with great warmth and hospitality!). Whisky is a very special Scottish drink..in fact it's more than a drink, it's a bond between people, a shared pleasure, sometimes in sombre times, but more often on joyful occasions such as New Year (Hogmanay), Burn's Suppers, weddings, funerals, business meetings, or sometimes just to keep out the cold! Whisky has been used for all manner of purposes..medicinal and otherwise, and it's as much a part of Scottish culture as the tartans, the purple heather or the bagpipes. No wonder they call it the 'breath of life' or the 'water of life', ..from the Roman "aquae vitae". The Gaelic words for "aquae vitae" was "uisge beatha" which eventually through time and mispronunciation became what we know now as "whisky". Although whiskey is made all over the world, from Ireland to, perhaps less obviously -Japan - Scotch Whisky (note the spelling!) can be made nowhere other than Scotland. 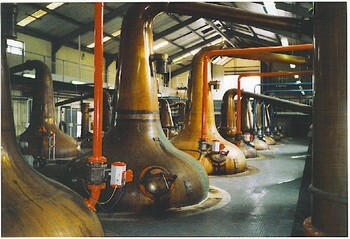 Part of the mystique is in the distillation, and that's a protected rite..rather than a mere recipe. It must conform to the Scotch Whisky Order of 1990(UK), mature for three years and one day, no less, in an oak cask and must not be bottled at less than 40% alcohol by volume. Just so you know! That's how long it must mature, and no, it doesn't mature in the bottle. From the minute it leaves the aged cask, that's how old it is. If it's blended with other whiskies, then its age is judged by the youngest addition. It's strictly regulated by Parliament, and almost as old as Scotland itself. Way back when only the monks knew how to make whisky, and when they left their monasteries, they had distilling to fall back on as one of trades they knew well, and gradually they taught it to the people of Scotland. Some say originally the secrets of whisky-making came from Ireland, but the facts about who exactly invented it are lost in the mists of time..was it the Irish with their "whiskey" or was it the Scots with their "whisky"? 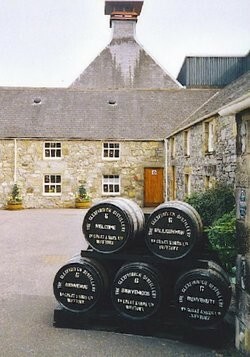 The first written record of whiskey came from Ireland in about 1405, and from Scotland in 1496. 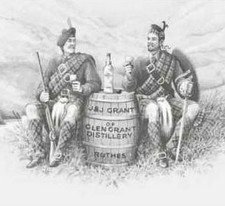 By the way, "Scotch" is how to describe the whisky, not the people.. they are Scots and just may be offended if you call them Scotch...perhaps understandably so! The most treasured of the whiskies are the single malts. Malt whisky is made from malted barley, (malting is soaking the barley seeds in water until they germinate, then quickly drying them out with heat)and has a richer flavour than grain whisky. Grain whisky is made with ingredients other than barley, such as maize or wheat and pure grain whisky is used for blending with malt whisky. Another 'must' as far as the distillation process goes, is that Scotch whisky must not contain any added substance other than water and caramel colouring. Long before whisky distilling was legal, and smuggling was rife, illegal stills sat close to the places where the distilleries sit today..many hidden in the crags and hills of the Scottish mountains, using the fresh spring water from those mountains in the distilling process. 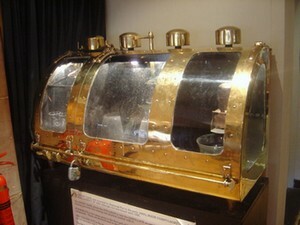 Around 1780, there were only about eight legal distilleries and a whopping four hundred illegal ones! Whisky's popularity over wine was further boosted in 1880, when the nasty phylloxera beetle destroyed wine and cognac production in France. 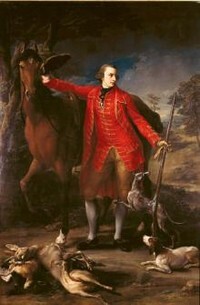 Shortly before this time The Duke of Gordon, on whose large and sumptuous estate whisky was already being (illegally!) produced in great quantities, had suggested to Parliament that the making of whisky should be legalised, and so it was that in 1823, for a licence fee of £10 pounds plus a certain set fee per gallon, the making of whisky was made legal by the "Excise Act". 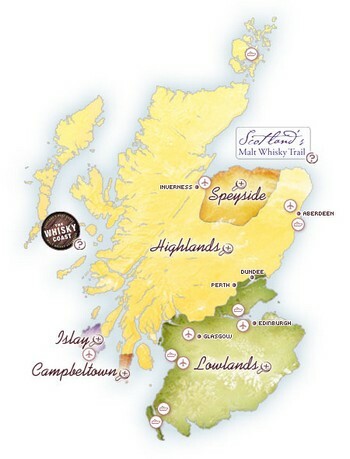 Now you can tour these distilleries, see the process for yourself, experience the mystery, fascination and atmosphere of a Scottish whisky distillery, plus...sample the finished product and see the best the Scottish countryside has to offer. What better reason could one have to visit all these wonderful locations...! The first distillery I visited was in a beautiful town called Grantown-on-Spey, which is next to the Spey River..(a very popular place for salmon fishing I might add), called the Tormore Distillery. Even as a child I found it most interesting..the aroma of malt, the huge stills, the rather exotic looking whisky safe..and of course the ritual whisky tasting after the tour, from which I was forbidden to take part. Nevertheless it was an all-round very enjoyable experience; the tour was conducted by friendly and well-informed people, and Grantown-on-Spey itself another great place to visit....By the way, the aroma of malt is unforgettable and surprisingly pleasant..
Now it's possible to take a tour of all these distilleries, and there are quite a lot of them. The Royal Scotsman Train will take you to one or two in great comfort and luxury, but there are other ways, just as fun and just as comfortable, so I want to give you some more sites (listed below) so you can choose the tour you would enjoy most. They are all picturesque buildings located in splendid Scottish countryside and the hospitality is something to write home about. It all amounts to the ultimate Scottish experience..
Whisky is made all over Scotland, in the most delightful places, and the distilleries are proud and happy to give tours, share with you some of the secrets of the ancient process, and more often than not, let you try some! 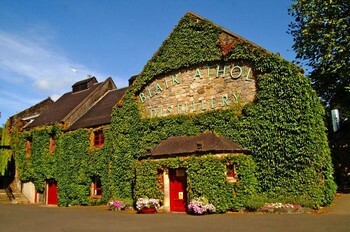 You can even stay in a cottage on the grounds of a distillery and one of the sites listed below gives you all the information you need about that prized spot!